Finding time to practice yoga as a mom is always a challenge. The best advice I was ever given was that "some yoga is better than no yoga at all." The best yoga sequence for stay at home moms is one that requires little to no props, is quick yet effective, easy to get back into if interrupted, and safe. There is nothing like soaring into Crow only to have your toddler see that as an invitation for a “horsey ride” and you then fall flat on your face. This 20-minute sequence is one you can easily sneak into your daily routine. So when you see a moment break, hop into this sequence and steal a few moments for yourself! Start here and take a moment to center. Do a full body scan and release any tension as you shift from your role of mom to yogi. Really focus on lengthening through your crown and grounding through your feet. This pose is amazing for bringing awareness to your body. It also helps correct your posture and steadies your breathing. Take 7-10 breaths here, whatever feels good in your body as you start to warm up. From here, swan dive to Forward Fold. Uttanasana is perfect if you're in dire need of a good leg and lower back stretch. Focus your awareness on loosening the daily tension you mamas carry in your neck as you let your head hang heavy. This helps fight anxiety, fatigue, and depression, and is a great reset button for your day. Stay here for 5 breaths then transition into Downward Facing Dog by walking your hands out in front of you. This is both a stretching and strengthening pose which is perfect for moms on the go. It is also a great way to work on a healthy alignment whenever you practice at home. Hold this for 5 breaths then find your way onto your hands and knees. This pair of poses gets your heart and body moving. This fun and fluid flow activates your core, yet also stretches your neck and spine in a comfortable way to work out the daily grind and kinks you may have encountered in your day. Hold for 5 breaths and on your next inhale, lift and extend your right arm and left leg. This exercise allows you to work your core as you extend and hold your opposite arm and leg up. It also gives you time to appreciate what your body can do while strengthening it and getting a good workout. Hold for 5 breaths and then switch sides. After 5 breaths on the other side, lower your arm and leg and slide your hips back as you settle into Child’s pose. This calming pose helps relieve stress and tension all while providing a good stretch to your legs. Stay in this bliss for 5 breaths. At the end of that, slowly lift hips into Down Dog and bring one bent leg forward. Once this leg is forward, lower your knee down and bring arms up into Low Lunge position. 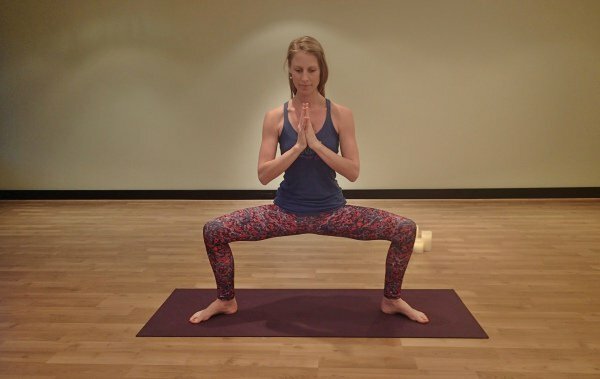 This pose brings in warmth into your hips as it opens. As you stay here, you can feel your mental focus sharpen, which we all know is a necessity not just for at-home moms, but for everyone. Stay here for 5 breaths and switch sides. Once you have done both sides, you can Vinyasa from Down Dog into a standing position. At the top of your mat, bring your right leg back and point your toes to the corners of your mat. Standing in Goddess pose will automatically create feelings of strength and beauty, and help you feel like the warrior you are. In addition to the confidence boost, it also helps build strength in your legs and gets your heart pumping. Hold this pose for 5 breaths then Vinyasa with it. On your inhale, straighten your legs and bring your arms up overhead. On your exhale, sink back down into Goddess. Do this for 5 breaths. You can end the sequence in Goddess pose, but if you feel like taking it further, you can hold Goddess pose while you alternate lifting your heels for an even more vigorous workout. After this, heel-toe your feet together and slowly sink down into a Yogini squat. This pose brings an immediate calming energy as soon as you sink down into it. As your mind clears, your body also takes its sweet time to heal, aid digestion, and eliminate toxins. Hold for 5 breaths. Then slowly come into an easy seated position. 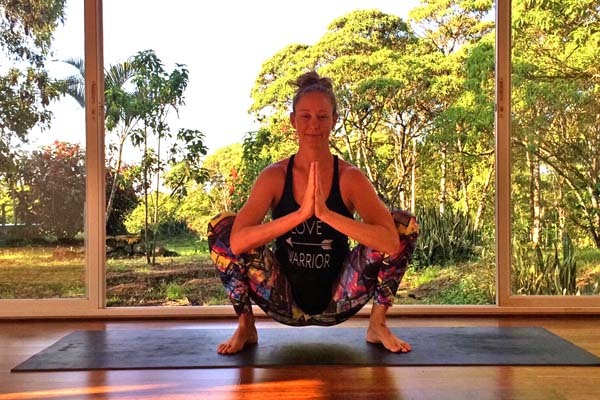 Sitting in Butterfly pose instantly releases tight hip muscles and you will find yourself relaxing and your brain slowing down to a peaceful calm. Another benefit to this pose include oxygenating your reproductive and digestive systems. Hold for 5 breaths. Lay back and bring your heels to your buttocks. This is a great, gentle inversion to end your 20-minute practice. 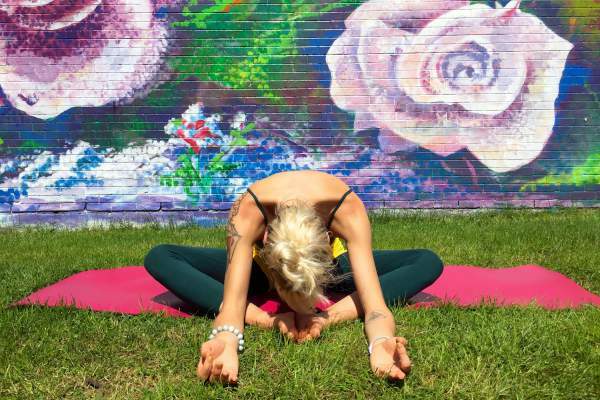 Bridge pose stimulates the reproductive, digestive, and nervous systems, and can remedy common ailments such as congestion, headaches, and high blood pressure. It can also relieve aches and tension in your upper body and rejuvenate the muscles in your lower body. Stay lifted in Bridge for 5 breaths. You can then release your legs down and melt into Savasana for 5-7 breaths before getting up. You can also have a little “yoga recess” to stretch anything else that you feel needs it, if you have the time. The focus of this sequence for at-home moms is to take a moment to stop. This brief pause will pull you away from the physical, emotional, and mental stress at home and replace it with some mindfulness. The beauty of this 20-minute yoga sequence is there are many ways to go off and make this customizable to you and your needs that day. It's also an easy and simple one that you'll be able to sneak in anytime during the day. So mamas, stop, breathe, and find that time to heal!